Ontario car insurance rates are still by far the highest across Canada. This publication looks, in detail, at these rates and scrutinizes the recent approval of rate changes by the Financial Services Commission of Ontario (FSCO) to understand what consumers can expect in future. We also look at several possible scenarios how car insurance rates can develop in 2017. How Much do Ontarians Already Pay for Their Auto Insurance? The amount of money Ontarians pay today for their car insurance is exorbitant. According to our proprietary data collected through an independent rates comparison service, Ontarians pay, on average, $1,923 annually. It is by far higher than Alberta, British Columbia, Nova Scotia or Quebec, if we look at several provinces in Canada with $1,428, $1,438, $1,093 and $926 in annual car insurance premiums respectively. A while ago, the Liberal provincial government set up a target of a 15 per cent rate decrease between 2013 and August 2015 but, as already known, it has not necessarily worked out, as acknowledged by Kathleen Wynne, Premier of Ontario. What is the Mechanism for Increasing Auto Insurance Premiums? Given the fact that car insurance is a tightly regulated insurance product, all rates changes should be approved by a provincial regulatory body such as the FSCO. This body looks at insurers’ proposals to adjust insurance rates and approves them if they are justified (based on higher claims payout, danger of company to run into bankruptcy, etc.). FSCO itself says that its rates approvals process ensures that the rates are “just and reasonable”, “not excessive” and “not going to impair a company’s financial solvency”. According to FSCO, an adjustment of rates means that an insurance company experienced changes in insurance claims payments (for example, a higher number of claims) and rate changes ensure that it can still run its business and provide insurance services. What Rate Increases has been approved by FSCO? We compiled an overview of approved rates for the last three quarters, highlighting in red the changes that led to rate increases. Even without analysis, one can see the trend of rate increases toward the end of this year. Further below, we tried to asses a long-term trend for rate changes and predict how it will look like in future. As you can see, the number of the companies increasing their rates moved from two in Q1, 2016, to seven in Q2, 2016, and to 12 in Q4 (highlighted in red). What is a Long-Term Trend? There are a couple scenarios that we will look at in detail. 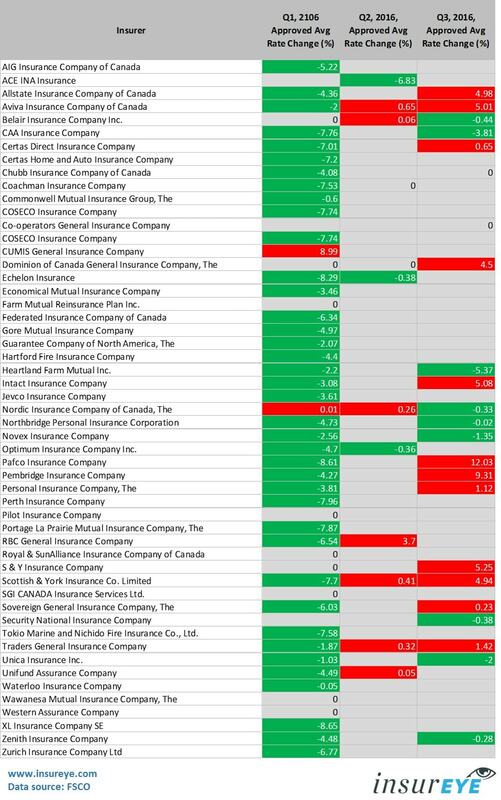 Scenario 1: If we look at a long-term trend based on all quarterly values since Q3, 2013 (three years back) – based on this data it appears that in Q4, 2016 and in 2017, consumers in Ontario will still experience an increase in insurance rates, though growing less aggressively than in Q3 of this year (shown as a dotted line). Scenario 2: Should we rely only on data from the last five quarters, the picture stays similar – rates might grow even more aggressively in Q2, 2017 (shown as a dotted line). A scenario with lower insurance rates is still possible, but less likely. From our perspective there is less pressure on insurers now to reduce their rates since an official target has been already been missed anyway, and there are no new targets announced. Lack of accountability means less of a positive outcome. How Can the Rates Become Lower Again? Well, there are a few major drivers behind high car insurance costs in Ontario. Addressing several of them will positively impact car insurance rates but the question is, if insurers and government really want to do it, or would they prefer to see a rate increase as a simple solution to a complex problem. Driver #1: Inefficient and ineffective claims process: Unfortunately, today’s claims management processes across most insurers is very inefficient, resulting in longer processing times, a lot of resources involved in the processing of each claim, and as a result, higher claims costs. In a digital era, some insurers still work with paper-based insurance claims, carrying around stacks of paper. Add to that a so called claim leakage – paying for a claim that does not qualify to be paid, or overpaying a claim amount. Unfortunately, there are also cases where insurance customers are entitled to getting their claim paid, but these claims are not paid. In other words, today’s claims process is slow, inefficient and expensive. Driver #2: Insurance fraud: Insurance fraud is huge problem and without the intensive involvement of government, the dimensions of fraud will just increase. There are whole rings of fraudsters, from doctors and rehab staff to paralegals, who are getting involved in the claims process, benefitting from it in unfair way. A recent investigation undertaken by Aviva (see the video below) shows the size and approach of the fraud in this industry. Without addressing this issue through a combination of government levers and investigation via insurers, there is no way that we will see a reduction in insurance rates. Driver #3: Inefficient Insurance Operations: Another reason for insurers forced to raise their prices would be the constantly increasing costs of operating the business – from sales to policy administration and collections. Most insurers are still doing things in an old-fashioned way, not leveraging technologies such as mobile devices, online, digital, automation, etc. These technologies allow for the reduction of insurers’ costs by actually providing better service.Imagine that you can always view the status of your claim online instead of calling the claims contact centre every week. The latter requires your time and insurance staff’s time, and you can only do it during their working hours. If insurers become better in leveraging technology, their cost base will go down and they will be able to pass more savings to the customers while gaining more happy customers. Today, use of digital technology often does not go further than a simple online car insurance quote.An example of a company that is one of the leaders in technology use in Canada is Square One Insurance, where you can get a home insurance quote, purchase a policy online or manage your existing policy without making a single call (though you can call, if you want). 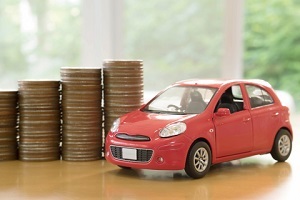 What is your take on the growing problem of auto insurance rates? Remember, one way for consumers to deal with this issue is to compare insurance rates by getting an affordable car insurance quote across many insurers. Our partners work with up to 20 insurance companies to provide you with car insurance or motorcycle insurance quotes.